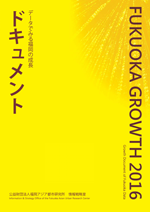 Fukuoka Asian Urban Research Center Information Strategy Office has published “Fukuoka Growth” that shows data on the growth potential in Fukuoka City since 2013. This year, we will continue to verify the growth potential of Fukuoka based on the latest fact analysis focused on “Innovation” which is drawing attention as the most important element globally. Through this distribution, we think that we could provide insights, not only for policies and business but also for everyone’s daily lives of Fukuoka City. For this first article, let’s grasp the regional characteristics of Fukuoka City based on data. As you can see, the area occupied by Fukuoka City in Japan is merely 0.1%, with 1.2% of the country’s population. It is a small city with area of 0.1% nationwide, but there is the population of 1.2%, a more than ten-fold figure. 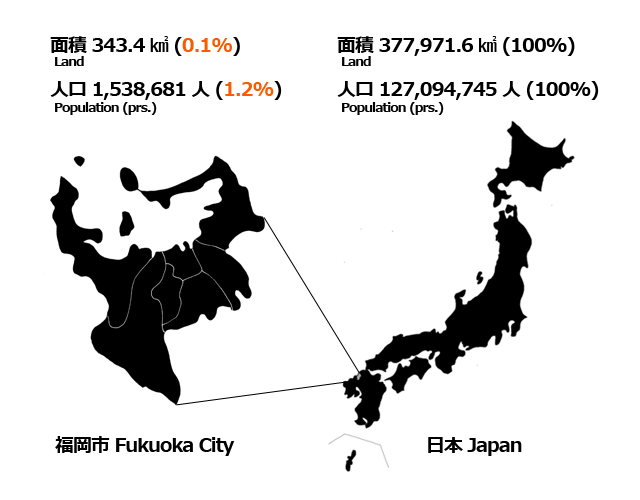 Nonetheless, Fukuoka City is only a small population area for the whole country. So, what shares do Fukuoka City occupy in all other indicators? 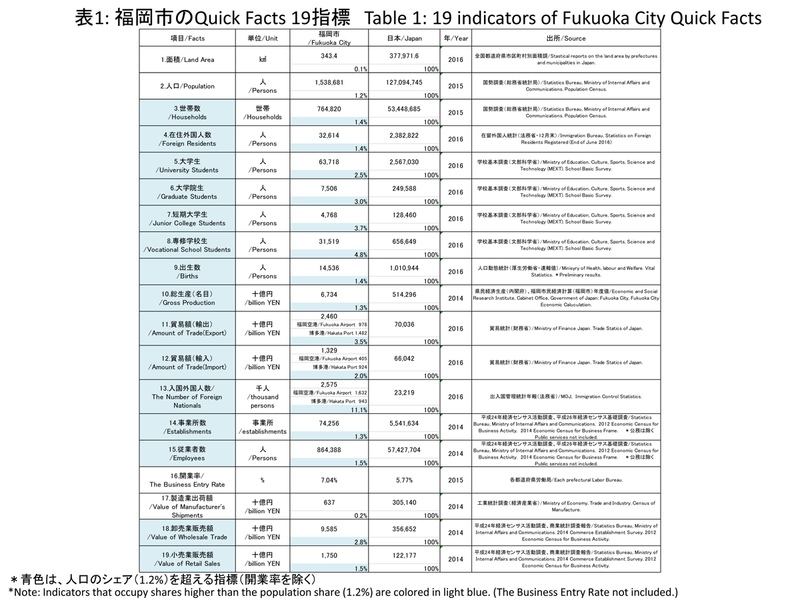 We collected 19 items of Quick Facts in social and economic fields including Fukuoka City area and population along with the figures across the country. (Table 1). Fukuoka City, which occupies only a small share of the area and population nationwide, occupy larger shares in many of the other indicators. Indicators that occupy shares higher than 1.2%, the population share, are the fortes of Fukuoka City, and therefore the characteristics of the Fukuoka region. Fukuoka city is characterized by a high proportion of students. It occupies the shares of university students (2.5%), junior college students (3.7%), graduate students (3.0%), vocational school students (4.8%) nationwide. Fukuoka City’s ratio of students in population is the second highest after Kyoto City, Tokyo (Fukuoka Growth 2016, p.35), which indicates that many students from Kyushu prefectures gather in Fukuoka City. Young people, mainly students, are a pool of creative ideas for innovation. The national share of foreign nationals, households, births also exceeds the population share. The fact that there are a lot of foreigners and child-rearing generations also contributes to the revitalization of the city. From these data it can be seen that Fukuoka City is a city full of vibrancy with its charm of attracting young people. The share of foreign nationals entering (11.1%) is prominently high in Fukuoka City. Fukuoka City has geographical proximity with Asia, and has deepened exchanges with Asia through people’s movement and trade. In recent years, the number of tourists from Asian countries has increased dramatically with the worldwide trend of the increase in the number of tourists. The number of foreign cruise ship calls to Hakata Port is far greater than other domestic ports (“Global Networks of Fukuoka“, p. 43). As a result of actively investing in inbound tourists, such as maintenance of Hakata Port corresponding to an increase in cruise ships, and a number of openings of LCC routes to Fukuoka Airport, the number of foreign nationals entering in Fukuoka City accounted for approximately 10% of the whole country. Immigrants from the two ports are in order of Korea, Taiwan, China, Hong Kong, with extremely high weights in the Asian region overall (Fukuoka City Tourism Statistics (Linked page in Japanese)). Fukuoka City is enhancing its role as an Asian exchange base and is further evolving as a global city attracting inbound foreigners. In the economic indicators, all indicators except manufacturing industry’s shipment value share exceed the population share. The trade value share (export 3.5%, import 2.0%) and wholesale sales share (2.8%) occupy a particularly high share. In Fukuoka City’s industries, the ratio of tertiary industrial workers, including wholesale and retail trade, accounts for about 90% of the total number of employees in the city (Fukuoka Growth 2016, p.28). Because the share of workers is higher than the share of population, you can see the characteristic of Fukuoka City as a commercial city. Furthermore, Fukuoka City’s startup rate in 2015 is 7.04%, which is much higher than the startup rate of 5.77% across the country. The high startup rate represents the high activity of business in Fukuoka City. In the history of the Fukuoka region, we have promoted trade with Asian countries, taking advantage of geographical characteristics. Also in modern times, trades starting from Fukuoka Airport and Hakata Port symbolize the characteristics of Fukuoka City as an international commercial city. It turned out that Fukuoka City has regional characteristics as we have seen. Then, in what kind of fields is Fukuoka City growing now? 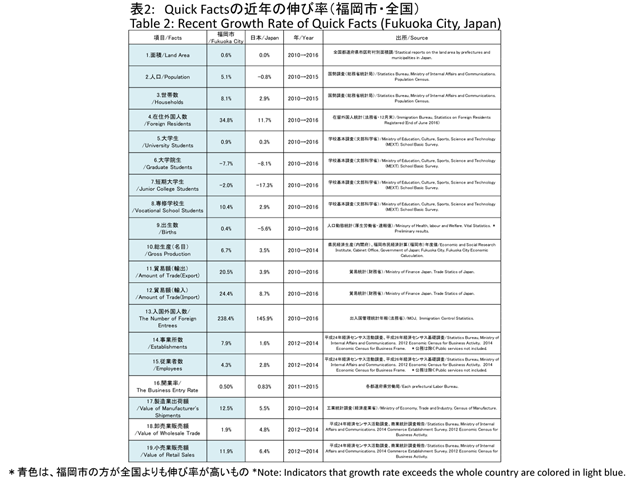 The dynamism of growth in Fukuoka City can be grasped by the recent growth rate of each indicator (Table 2). 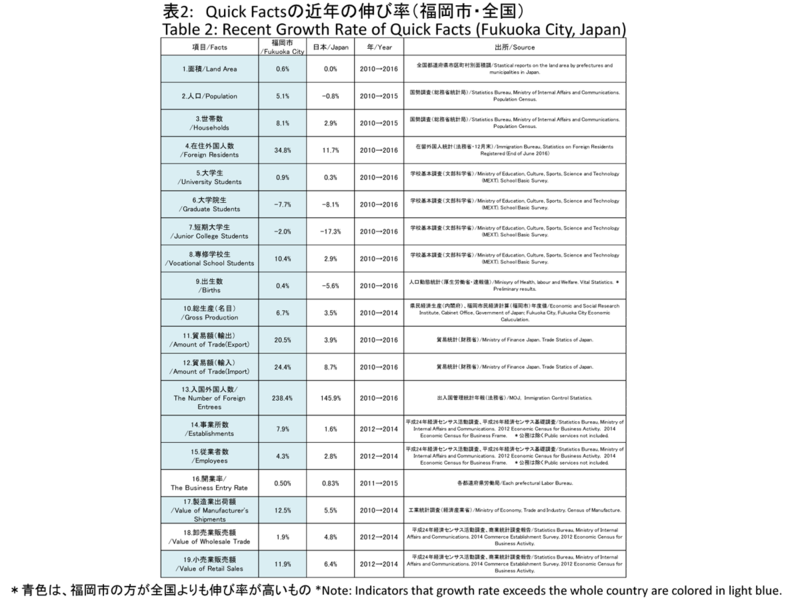 When comparing the growth rate of Fukuoka City and the whole country, Fukuoka City exceeds the whole country in 17 items. It becomes clear that Fukuoka City is on the wave of dynamism of growth. The population growth rate of Fukuoka City over the past five years was 5.1%, the highest among the 23 wards of Tokyo and ordinance designated cities of Japan. Furthermore, the number of households is increasing at a pace that exceeds the population growth rate. However, the increase in the number of households is considered to be mainly caused by an increase in single households. As for the number of students, although Fukuoka City exceeds the growth rate and decrease rate of the whole country, the number of graduate students and junior college students is negative. We can anticipate that the influence of the declining birthrate and aging population in Japan is influencing Fukuoka as well. Looking at the dynamism of the population indicators, we can see the possibility that the future growth of Fukuoka City will be declined. On the other hand, the number of births was minus 5.6% nationwide, whereas in Fukuoka City the number of births has risen by 0.4%. Further growth as a city that is easy to work while raising children is also required. In economic indicators, the gross production value (nominal) increased by 6.7% over the period of 2010 to 2014, far above the nationwide value. Although wholesale sales volume fell below the national value, retail sales volume increased by 11.9%, exceeding the nationwide 6.4% increase. The number of offices (7.9% increase) and the number of employees (4.3% increase) also showed growth rates that were significantly higher than the nationwide value. Although the growth of the startup rate from 2011 to 2015 in Fukuoka City is below the nationwide value, the startup rate itself has been beyond the nationwide value, which shows business and employment are newly born, and the economy of Fukuoka City has clearly grown. Talented people from various countries, mainly from Asia, are gathering in Fukuoka city. The growth rate of foreign residents living in Fukuoka city for 5 years (34.8%) showed a significant increase over the whole country (11.7%). The increase in foreigners staying in Fukuoka city over the long term seems to contribute to the increase of the population and gross city production. The increase in the number of foreign nationals means an increase in foreigners staying in Fukuoka city in the short term. The increase of these people seems to be promoting the retail sales amount in Fukuoka city. Growth in Fukuoka city ‘s trade value also correlates with economic growth in Fukuoka city. Even in Fukuoka City where the ratio of manufacturing industry is extremely low, we export foreign goods to the region by exporting products with high added value overseas so that the manufacturing shipment value is growing. In the economic calculation, consumption of foreigners in the country is also recorded as “export”. In order to sustain the economic growth of Fukuoka City, it is clear that efforts to “export” while creating value-added services by “innovation” are important. 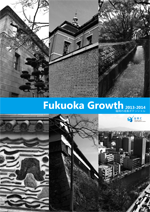 Have you grasped the regional characteristics of Fukuoka City? Since the next edition, we will pursue the endeavors of creating “innovation” in Fukuoka City, focusing on individual themes that are growing dynamically in Fukuoka City.